GPU cooling? What do you do to keep the GPU cool? This section will try to answer the most often asked questions I get. I have been asked this question in the past few days quite a few times. I read what was posted by Precision Division on their eBay ads stating the BIOS files do not fix the issue, and how they modify the fan. You have to be aware of what causes your system to fail, and what needs to be done to fix it. You have to do four main things such as update the BIOS and video drivers, exit the heat, reapply thermal paste, and change the handling. As a repair outlet I can only do so much during the repair. Thermal compound helps greatly. Updating the BIOS and video drivers do much more for a system than hardware mods can alone. Handling has to be changed though. I can modify the fan easily enough by clipping one wire. I suggest purchasing a laptop cooler because when it breaks and the fans die on that system it is easier to change than the weaker CPU fan that is internally in the system. As many already know, the heatsink on a DV6000, DV9000, F500, and F700 are L-shaped. Heat travels through the L-shaped heatsink to exit the system. With a weak fan exiting heat, the heat spreads through the system making the fan work harder to exit the heat. This heat remelts solder, heats your components, wears the bearings in your fan, and weakens your battery cells. Laptop cooling mats do more to move heat than the CPU fan can do on its own. Thermal compound is key to thermal recovery. The compound absorbs the heat and causes the transfer to happen quicker. In conjunction with a chill mat, this is key to moving heat so it does not spread through the system. BIOS and video drivers are important because they both handle how the video and system work to displace heat. The Nvidia drivers add support for games and DirectX applications, but also do more important things like bug fixes. Bug fixes can be simple problems as what the new drivers do as of 2009 which is cause the GPU to run at 10 to 20 percent power when idle. I cannot do that to as system, and neither can any other repair outlet unless they install the drivers. The BIOS update runs the fan at 5v for the complete time the system is on, but it also does another important duty: It runs the CPU at a lower GHz when it is idle the same as the video driver. This cannot be changed in the BIOS without a BIOS update. Finally, handling is probably the single most important task. As a user you have to know your system, know the reason for the failure, and change your handling. I get calls to ask about reballing and re-stenciling with leaded solder. That will not help with anything. Heat causes solder to weaken and crack so you have to handle that issue. So handling as a user is key to continued working of a new or repaired system. As a user you have to take simple no nonsense precautions to extend the life. Do not let your system sit on a cloth surface. Do not block the vents. Do not hibernate or Stand-By your system. Turn your system off when you are not using it. Copper shim question – Do you add copper shims or pennies? Your issue with the onboard BGA chipset is heat related. HP DV2000, DV6000, DV9000, TX1000, Dell D620, D630, D630, D820, D830 systems with Nvidia chipsets have the known BGA issues that I can fix by reflowing them. Now, the question above is asked to me constantly. I personally do not use copper shims. Copper shims and pennies before 1981 do not fix your issue, but do more to hamper it. You will have three things that can happen. These are an electrical arc, an overload, or a soldering issue. Your chipsets on your laptop 9 out of 10 times are fine if that have not been worked with in anyway and can be reflowed properly. The chipsets have capacitors located on the top and these capacitors are actually made of ferrite. When you apply Artic Silver and the copper shim in direct contact with your chipset you have stress fractures or arcing. Heat will cause the chipset to move up and down, by design, and will cause the copper to flex causing the capacitor to complete a circuit arcing between the chipset, the shim, and the heatsink which has copper in it. Placing a plastic spacer does not help any since the heat will melt, deform, or damage the chipset in its own right. Now your chipset may get an overload and burn it out internally with no outer signs. Usually on a DV6000 system you will see a three capacitor cluster on the motherboard overload, and burn the planing of the motherboard. Overloading will cause the chipset to pull more power in the board causing stress on other chipsets such as the MAX8774, Max8724E, and MAX8734A. The simplest issue is that your chipset will heat and the shim causes the solder to glob or puddle on the underside of the chipset. There is a reason the CPU is 5mm and the GPU is 3mm with no need to place a copper shim in to damage that design no matter how poor it may be now or before. What if my need is not listed? As an electronics technician, laptops and desktops are not the only items I work on. If you have a specific need that is not isted above, please feel free to email me at james@doubleclickittofixit.com or call 706-307-9689. 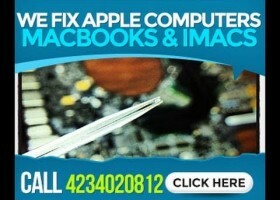 If you have stood undecided on whether to get your motherboard repaired for any reason, let us offer you a special. For the month of October we are offering motherboard alone reflows or reballing for just $50.00 a board and $75.00 if you send the entire laptop. Now, this does not include parts but if you send multiple units shipping may be on us for returning your systems to you. This will include DC jack services also along with the BGA reflow and reball services. If you are interested, give us a call at 706-307-9689 or write us an email in our automated email service. This email will serve as an update on the status and repair of your systems sent in. As agreed your system is billed at $125.00 for the reflow plus the cost of the screen. Now, with the HP DV9000 with the serialization of CNF6490HZ8 has been reflowed and is ready for return. The motherboard is listed as HP Spare 447983-001. The system reflowed on both the Nvidia GeForce GO8600 (NF-G08600-N-A2), Intel SLA5D, and the Intel SLA5Q chipsets. Your system was shipped without a power adapter. Your system also required a LCD and inverter replacement as part of the repair service. These two units were purchased and replaced. You also need to update the video drivers from Nvidia.com and the BIOS from HP if one is to be applied. Please advise your end user to purchase a cooling pad to help insure the removal of heat from the system. Are reflow services all you perform and will a reflow fix a blinking jack on a… Compaq CQ50? I get asked this question fairly often, and the answer is no. We do not simply repair systems like the Compaq CQ50 that are affected by the Nvidia chipset issue; as a side note, the issue is not just related to Nvidia chipsets since it also affects Intel GPU based systems along with ATI GPU based systems also. As an example we received a local drop off service for a Compaq CQ50-139WM laptop system that displayed a flashing DC jack and no power to the system. The DC power jack blinked in a uniform fashion to indicate an error code, but error codes are not detailed by HP or Compaq for blinking DC power jacks, to our knowledge for the Compaq CQ50 or any system. The Compaq CQ50 was delivered due to the belief it required a reflow service for the chipsets since the laptop is a common system to be affected here recently with a chipset failure, but upon further inspection this system is an Intel based laptop (506519-001) with an Intel based processor (SLB6M) and Intel based GPU chipsets (SLB8Q and SLB95) which are rarely affected by reflow issues. Usually we test the memory to verify that the memory is not dropping the voltage since the DDR2 slots are reversed in the Compaq CQ50 line of laptops, but a blinking DC power jack does not indicate a short, no power, but indicates a reset from a power rail failure, a blinking DC power jack. Currently, we have a system with an Intel motherboard from a Compaq CQ50 laptop, a blinking or pulsing DC power jack, and memory that is not found to be failed. Our only option is disassembly of the laptop to verify the issue from the circuit level diagnostics using our Fluke based testing equipment. We use a simple Fluke 117 RMS digital multimeter to test most motherboards in our shop. The multimeter can give you the best diagnostics for the laptop from our tests. One hour later, our Compaq CQ50 laptop is disassembled and is lying ready for the troubleshooting we perform. For our testing, we only use HP branded OEM power supplies. The difficulty with using a non-branded power supply from China or a Targus adapter from Walmart is that the power supplies are variable rate and variable wattage which could lead to issues with diagnostics. A variable rate power supply may not supply the correct or higher level of Amps while still supplying the correct wattage which could lead to a false positive while diagnosing your system on the bench. Before we even test the laptop again with power we test the power rail which is located by the DC power jack. We test the mosFET labeled U1 with a signifier of 4407 on the chip which is a known mosFET to fail in both HP DV6000 and HP DV9000 Intel based and AMD based laptop systems regularly. The chip reads 0.000 which shows our test equipment is working properly to begin. The way we test this chip is across the VCC and the Ground legs to measure the reading. Now we plug the DC power jack in to signify that the power supply is good and blinking. We achieve this test outright by plugging the adapter in. Then we move to testing the laptop system with the power adapter plugged in to the DC power jack with our Fluke 117 multimeter. The multimeter gives different readings from the same position telling us the mosFET may be damaged internally. The mosFET is a P-channel mosFET. The gates within the chip are switching on and off giving us the variable up and down ratings. To be absolutely sure, we have to do a thermoelectric test by using our infrared thermometer. By using our thermometer we can get a reading of the chip and if anything internally is failing within the chip. The chip specifics state the chip to be in tolerances requires a 25C rating or a 77F rating. With this we test our infrared thermometer to check the office and get a rating of 76F for our room temperature in our office. After attaching the power adapter to the DC power jack and gathering a rating we had a reading well outside the range for failure specifying this chip is the issue with the laptop. Below is a video of our test displaying our findings with narration and explanation for those wanting to test or get a better understanding of the steps we took to test the unit. Can your local laptop or computer shop fix that? 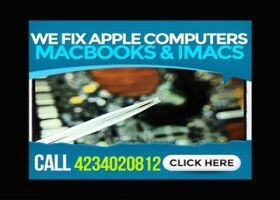 As a computer repair shop we see a number of damaged computer-related electronics pass through our door daily, but we also see a number of strictly electronic items from time to time. For example we had a gentleman in our local town bring us a solar panel that had a damaged crystal oscillator, if you need an explanation this will help here: http://en.wikipedia.org/wiki/Crystal_oscillator, that we tested, changed, and repaired his unit. To the point, we are not just an average break fix computer company. We are not just a degree holding computer repair facility. We are not just a reflow and reballing facility. We are an electronics company. We fix TVs. We fix amplifiers. We fix stereos. 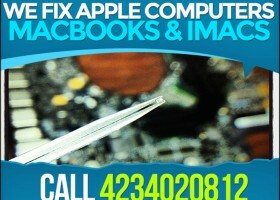 We fix laptops. We fix desktops. We fix TCUs. We fix printers. We fix battery chargers. We fix about anything that can be soldered or tested with a scope, multimeter, or continuity tester. We use only Hakko-branded equipment for our fine pitch soldering. We have all Fluke-branded electrical test equipment. Below is an example of a system that was sent to a Florida-based repair facility off of eBay who could not fix the unit. Their solution was to replace the motherboard. For all their soldering knowledge, testing equipment, and time they only could suggest a motherboard replacement. In the picture above the mosFET, http://en.wikipedia.org/wiki/Mosfet, was damaged due to a short overloading one of the gates. This simple solder work can only be performed by hand, with the right equipment, and with the correct knowledge. After the pick and place parts repair was performed we had a fully working and functional machine for our client in less than 24 hours. Now can your computer shop do this for you? If not, then we are willing to offer you a deal to try our service out in the state of Georgia.